You have already successfully completed the Open Water Diver course and are looking for a new challenge? Also, you are interested in search and rescue dives? Then the „Search & Rescue“ certificate could be just the thing for you! to communicate properly under water. 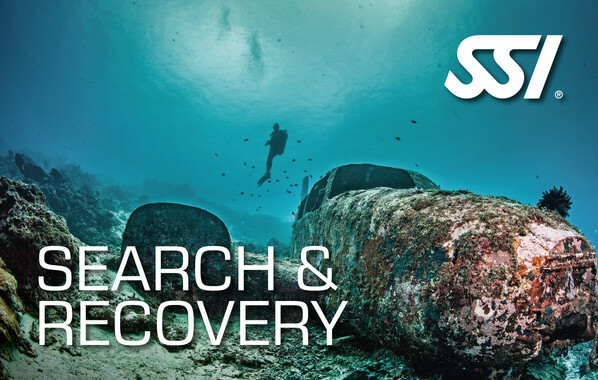 create specialized diving plans that help you find objects faster. use lifting bags and other special equipment to successfully retrieve small and medium sized objects. After completion of the theory and practical part of the course, you will be able to successfully carry out search and rescue dives. As always, the theory can be obtained via eLearning. You will learn the practical part in an SSI diving school of your choice. The minimum age for the „Search & Recovery“ certificate is 12 years. Theorie absolviert: Wie geht es jetzt weiter?